Charles Cary Rumsey, born in Buffalo, NY in 1879, was the second eldest of five children of Laurence Dana Rumsey and Jennie Cary Rumsey. The family, having inherited a small fortune built by Bronson Case Rumsey in tanning and railroads, was both wealthy and socially prominent. 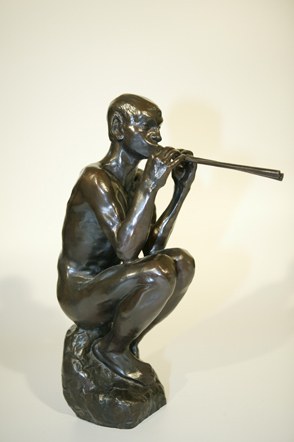 Charles Rumsey’s interest in sculpture appeared and was encouraged at an early age. He was taken by his parents to Paris in 1893. Instead of returning with them to attend school, he stayed in Paris for two years to serve as an apprentice to sculptor Paul Weyland Bartlett (whose father had been one of the early American champions of Rodin). After returning to the United States in 1895, Rumsey completed college prep studies at the Nichols School in Buffalo in three years, and entered Harvard in 1898. While at Harvard he joined the Porcelain Club, an exclusive association of young men from the most prominent families in America, making useful associations for a future sculptor. During the summers he attended school at the Boston Museum of Fine Arts where he studied under Bela Lyon Pratt. After graduating from Harvard in 1902, Rumsey returned to Paris where he took a studio in the Latin Quarter and enrolled and the Julian and Colarossi Academies. One professor, Emmanuel Fremiet, a specialist in equestrian statuary, devoted special emphasis to the study of the horse, and his training was to have a decisive influence on the young Rumsey. 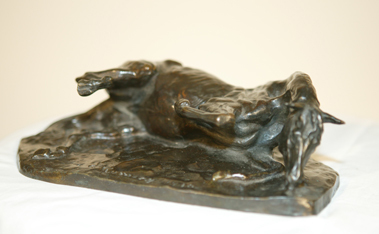 Apart from sculpture, horses were the great passion of his life. As a world-class polo player with the Meadowbrook Polo Club, (he was an 8 goal player) he won many awards throughout the United States. By the age of 23, he was also an amateur boxing champion in Paris. In 1906, Rumsey returned to the US where he settled into a studio in 59th street in New York City, New York. It was this year that his serious sculptural production began. 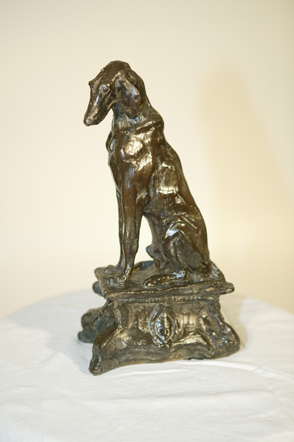 Around 1909, Rumsey began a series of sculptures to decorate the large manor at Arden, New York, being built by the railroad magnate, Edward H. Harriman (whose daughter, Mary, Rumsey he would marry in 1910). One of the sculptors was a large bronze fountain of The Three Graces for the terrace outside. A recast of The Three Graces fountain was installed in 1987 in Mirror Lake in Buffalo’s Forest Lawn Cemetery where Rumsey is buried. When he returned to France in 1917 and 1918, during the war, it was as an officer in the 25th Cavalry Division of the United States Army. 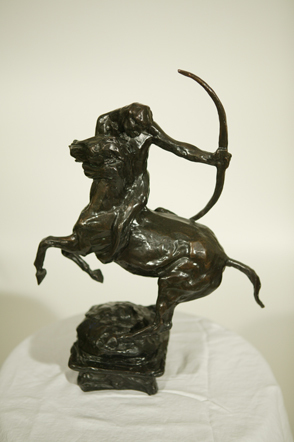 Rumsey’s specialties included equestrian sculptures – portraits of polo players and prize horses, as well as of cowboys, cattle and horses as metaphors. 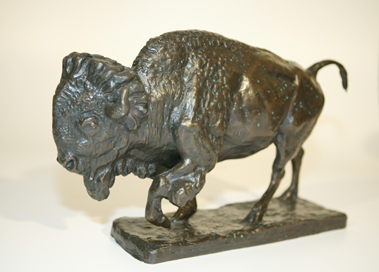 He worked principally in bronze and stone, often employing mythology and historical themes articulated in private commissions for freestanding statuary and in public monuments. Before his premature death in 1922, his work was evolving towards both modern and figurative works which are now compared to that of Henry Moore. His 40-foot bas relief panels of Indians, horses and buffalos for the Manhattan Bridge and the heroic subject matter of Rice Stadium commission are examples. Probably the artist’s most renowned work is the “Buffalo Hunt Frieze” executed in 1916 for the Manhattan Bridge in New York City. But the flattened and simplified figures for the Brownville Memorial in Brooklyn (1921) were his most adventurous forays into “modernism”. In these powerful bulky figures he comes close to an Art Deco style. Rumsey was one of the more notable sculptors working in the Beaux-Arts tradition, a monumental and grandiose style that was the chief mode of public sculpture of Rumsey’s day, yet he was far more than a standard producer of facile monuments. In his brief career (he died in an automobile accident in 1922) he touched on realistic and quasi-impressionist styles and at some points tentatively introduces some modernism that was included in the historically renowned 1913 Armory Show in New York, the exhibition that is credited with the first major introduction of modern art to America. Cody Museum of Art, WY.